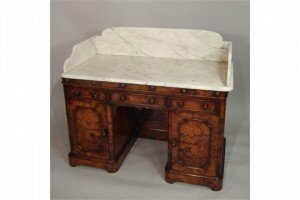 A Victorian walnut and ash kneehole wash stand, the white marble top with a raised gallery, above three frieze drawers and two panelled doors, on a plinth base. 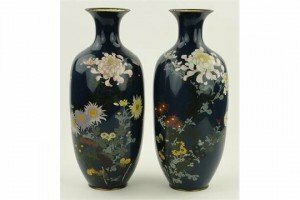 Large pair of Japanese blue ground Cloisonné vases, decorated with sprays of blossom and flowers. 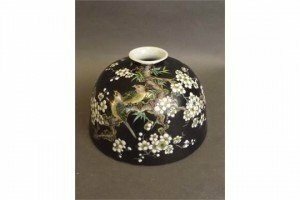 A Chinese black ground porcelain ink pot with painted enamel decoration of birds in a prunus blossom tree, 4 character mark to base. 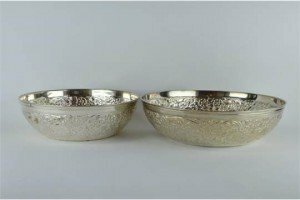 Two Indian silver bowls, the sides embossed and engraved with a wide band of flowers on a stippled ground. 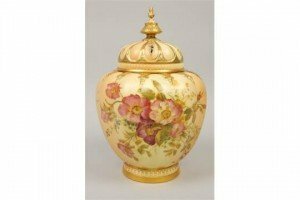 A Royal Worcester blush ivory ground pot pourri jar and cover, the lid with Islamic style piercing, enclosing a further inner lid, the base painted with flowers and leaves, printed marks in green to underside. 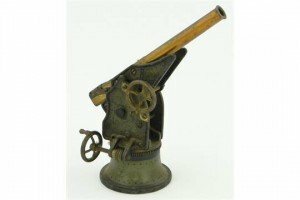 A First War period scratch built model artillery cannon, with brass barrel, working pinions and cast-iron rotating base. 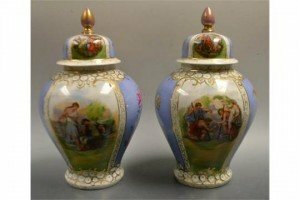 A pair of Continental ovoid ginger jars and covers, decorated with alternating panels, with classical figures and flowers and foliage on an azure ground, gilt scroll borders, domed covers, bud finials. 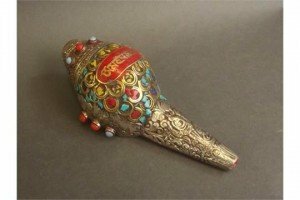 A Tibetan silver mounted conch shell with brass and semi-precious stone details. 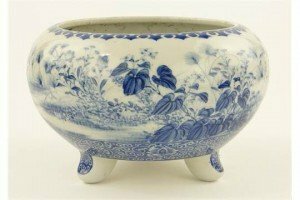 An Oriental porcelain jardiniere, of bulbous circular form with blue and white painted designs raised on 3 feet, painted inscription under base. 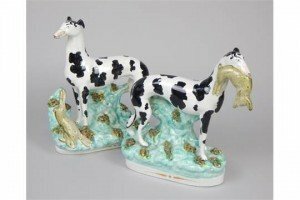 A pair of mid 19th Century Staffordshire figures, each in the form of black and white greyhounds with hares, on a turquoise shaped oval base. 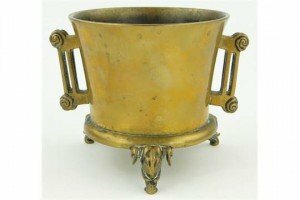 A Chinese bronze mortar, of tapered circular form, with pierced handles raised on elephant head feet, with seal mark under. 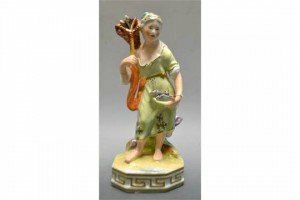 A Sampson Hancock Derby figure, Allegorical of Water, she stands bare footed in a simple green dress, securing her catch of fish in her skirt, canted rectangular and Greek key base. 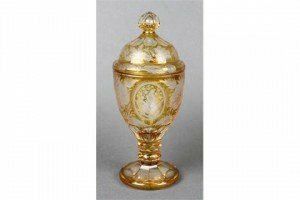 A 19th Century Bohemian flash glass vase and cover, the yellow ground with panels of birds amongst flowers. 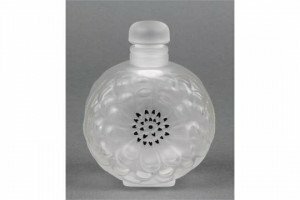 A modern Lalique frosted glass scent bottle in the form of a chrysanthemum, etched mark Lalique France. 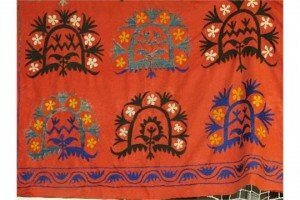 A large late 19th century Uzbekistan Sozani wall hanging, red ground with repeating turquoise, black and indigo motifs. 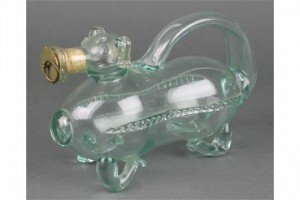 A Continental glass decanter in the form of a standing dog with metal mounted cork stopper. 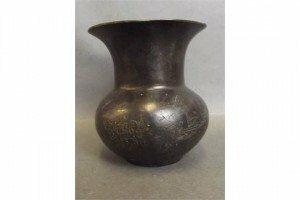 A Chinese bronze flared rim vase with engraved decoration of children holding lanterns, seal mark to base. 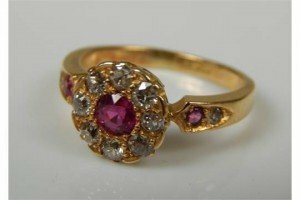 A ruby and diamond floral dress ring, the central ruby surrounded by eight smaller diamonds, flanked by a ruby and diamond to each shoulder, marked 18ct. 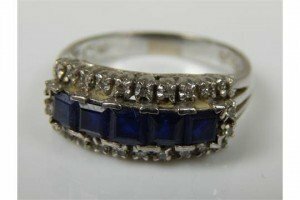 A sapphire and diamond dress ring, with five square cut sapphires, and surrounded by diamonds, in round brilliant cut stones. 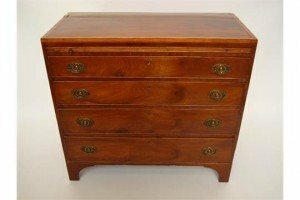 A George III mahogany chest of drawers, the satinwood cross banded and ebony strung top above a brushing slide and four graduated long drawers on bracket feet with oval brass handles.